Big Wheel Donk At No Guts No Glory 5! Big body donks are not just for show. When coupled with huge horsepower they can make a great spectacle on the dragstrip and this is the case at No Guts No Glory 5 where we see two lined up to go head-to-head against each other. You have the categories of small tire, so you could count this as overly massive tire racing, which almost looks strange to see on the dragstrip, but when you see these vehicles supercharged with a ton of horsepower, this is as good as any type of racing. The only real downside to this run is the fact that there are no time shown for the race. It would have just been interesting to see what these huge beasts could do in the quarter-mile. 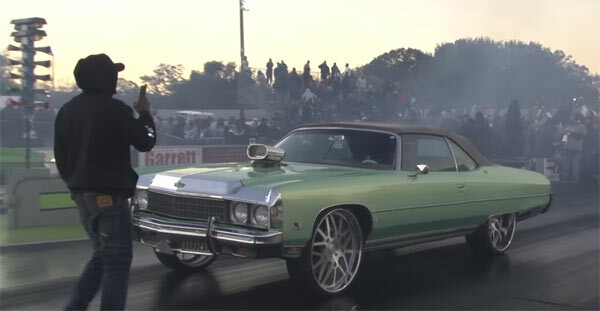 In any case it does prove that Donks not just for show, but can hit the strip when they want to. Related ItemsBig Wheel Donk At No Guts No Glory 5!